Hot news just in from Chris Blackwell at Hanseatic Marine that the 77m motor yacht Smeralda is now sold with BehneMar Dubai acting on behalf of the buyer. This third and most advanced vessel in the ground-breaking Silver series boasts outstanding performance and fuel efficiency. Smeralda has an impressive internal beach club with gym and massage room, a fully customised eight-person spa and sauna, large multi-function outdoor entertaining areas including a 'winter garden' with wraparound sliding glass doors, pool, and spacious, luxurious interiors. The yacht offers flexible and well-appointed accommodation for up to 22 guests with an owner’s apartment of impressive proportions situated on the upper deck and a further nine spacious ensuite guest staterooms throughout the yacht. 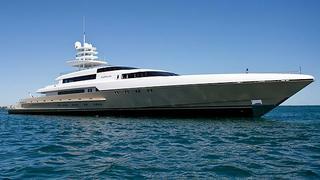 The yacht has been handed over to the Royal Family of Dubai, where her name will be changed to Sea Stallion shortly.